+2: Measuring Life Force in Water - new tool-Gold Coated Emu egg spherical capacitor connected to HeartTuner Shows ABILITY TO DESCRIMINATE CHARGED WATER - is REPLICABLE! +3: Update: Golden Mean Ratio in Physics- "Golden Mean as Clock Cycle of Brain Waves" by Dr. Harald Weiss, Volkmar Weiss - AND - Randy Masters data on Golden Mean in Hydrogen - KEY TO FUSION. +4: & Finally - exciting new pictorial: What exactly was SHINING Mr. Gardner? ... 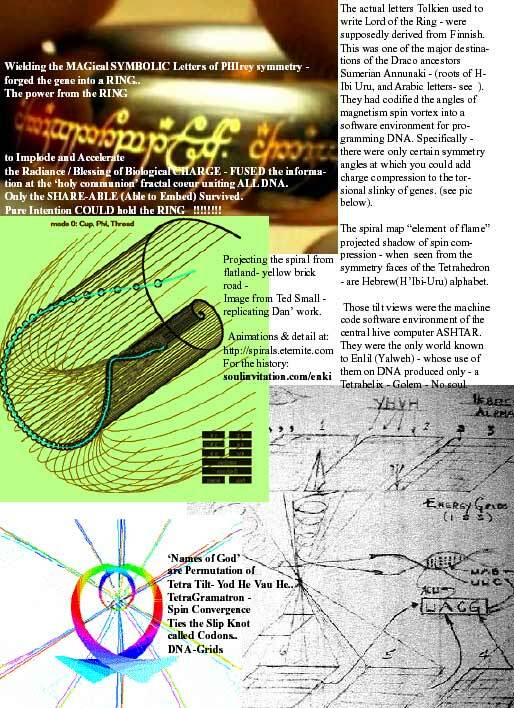 The Sacred Geometry of charge / bliss hygiene to ignite DNA into the (Implosive & Radiant) Grail Ring - Solving the mystery Laurence Gardner poses when he says the SHINING ONES- authored the Grail AND the Lord of the RING (from 'Realm of the Ring Lords'). How does the hex to pent 32 degree Merkabbah chin tilt to bliss end parasites by beginning compression/fusion - and how is this exactly like preparing to die successfully wherein only the shareable survive compression? In DNA -the great squeezer- compression produces phase discipline & coherence - physics name for pure intention: 'the shareable' (the only way sorting begins). From the Original Part Two Description: In Part Two of the Cert i f i c a t e Course, Dan Winter will delve into his incredible knowledgebase to reveal how the PASSION of the HUMAN H E A RT is the switch-point in interstellar DNA politics. He will also discuss the true power, physics and emotions of BLISS, and how the experience of BLISS can influence climate, the e n v i ronment, gravity and human re l a t i o n s .
To support this process, Part Two will be held in a retreat style environment over an intensive four-day period. During this time 'bliss'&'blessing' will literally change your physical well being with several types of SACRED MOVEMENT, including sacred circle dance, sufi dance, Gurdjieff Sacred Gymnastics and posture-induced ecstasy. Experience an intense ritual CHOREOGRAPHED IN TIME TO FRACTAL SPACE, TIME, STA R S AND MAGNETISM. 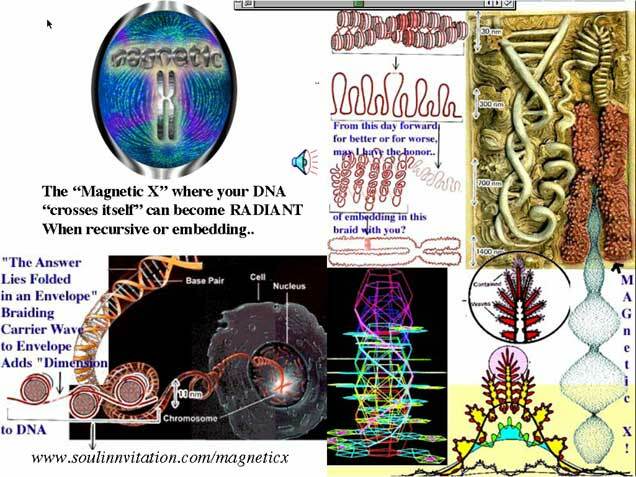 · The ET origins of human DNA, Gene splicing, UFO abductions and the attempt to get soul tornadoes braided into DNA. 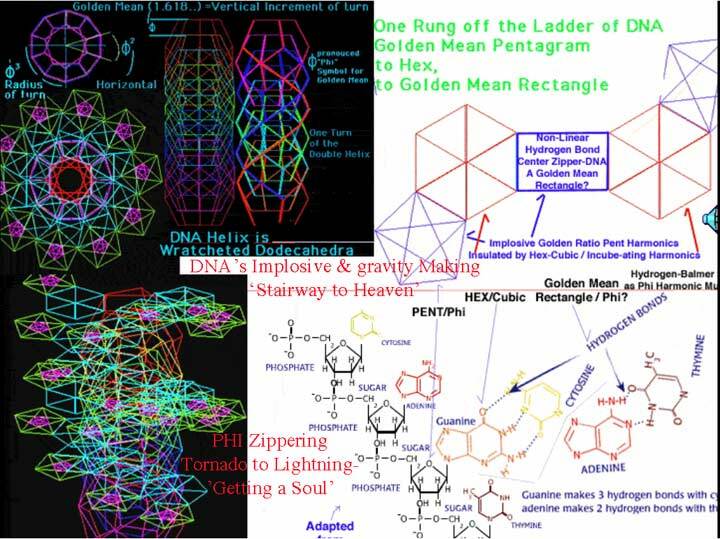 · The Sacred Geometry of Planetary Grids. FEELING MAGNETISM­ t h e PURE PRINCIPLE BEHIND PRACTICAL DOWSING. THE THEMES FOR THE ADVA N C E D WEEK ARE INTERW O V E N D E L I C AT E LY WITH THE ABILITY OF THE GROUP TO SUSTA I N INTENSITY AND BLISS. Real practice in diet and lifestyle in a pristine environment are critical and implicate in the process of the initiatory week. Each student will be asked to ASK enough questions to prove to THEMSELVES that they could begin to TEACH what they have LEARNED... The experience of Part Two will change your life. More Info -Sacred Geometry with Dan Winter , Residential 'Practicing Bliss' Retreat - is PART 2 of the certificate course. June 12- 15: Melbourne - Part One - 4 Day Intensive . With HeartTuner & Peak Experience Group. July 15- 18: South France - Part Two - 4 Day - Advanced / Residential in St.Tropez lush Tropical Retreat Center. Oct 3- 8: Peru - Cuzco Tour... exciting new Peru - Tour Itinerary ..
April 16-17 & 18, 2004: Lisbon- 2nd International Conference-Emotional Intelligence / Education and Health.. The concept reviewed: It has long been known that the Kirlian Photo and the GDV (Gas Discharge Visualization) were a way to map the shape of the capacitive field of charge which was providing the orienting function to arrange biological liquids into life. It is also self-evident that the sensitive crystallization (Steiner Technique), water drop experiments, and such techniques as Immoto's work with water crystals shape revealed during freezing - were all techniques to make the shape of the field of charge of the liquid visible. ( It is also clear that the measurably faster than light propagation of the gravity field measured using capacitors - proves the physics of astrology is simply to map the projective geometry of the charge field capacitively.) The resolution of the problem then of quantifying and measuring LIFE is the problem of accurately measuring the order and COHERENCE of the electrical field of charge. The amount of life giving information in the charge field is a) coherence , b) harmonic inclusiveness - which is correlated to c) ability to acheive charge COMPRESSION - which IS information density. It happens that self similarity (think of the shape of a pine cone) perfects the implosive charge sucking in process of compressing charge into the acceleration of charge thru light speed called LIFE ITSELF! (explaining how the egg and the pine cone and the EKG during bliss extract voltage from gravity: gravity IS implosive / non-destructive charge compression which self similarity by PHI turns in to acceleration | goldenmean.info/phiricais ). In summary - while Dr. Popp correctly surmised that the ability to store and emit a photon measures life - (biophoton) - the PROCESS which allows biology to store a photon IS the ability to (fractally) ATTRACT and SELF-ORGANIZE electrical charge. This is why D.Winter extended the Celestine Prophecy definition of LIFE ( All Human Interaction is About CHARGE) - to read more completely - LIFE FORCE EQUALS THE ABILITY TO ATTRACT (Implosive Compression) and Self-Organize Electrical Charge. It is simple to understand that the weak capacitive charge field is what makes the critical orienting decision at the instant the liquid decides in what angle to join the crystal. (for example the physics of rainmaking - goldenmean.info/rain , or of restoring life to cities - goldenmean.info/lightcity ). Biology happens when liquid approaches the tight rope of becoming liquid crystal due to the COHEREing of CHARGE. The physics of sensitive crystallization is therefore totally dependant on the ORDER implicate in the ambient electrical field of charge. Thus LIFE FORCE is determined solely by the ability to compress, store and radiate this capacitive field. ( your Glow is your Charge radiance). We here present a brief summary of the newest data showing this measurement of life force applied successfully to measuring vitality in WATER. ( We propose to follow this with a demonstration of corrolation to increased percentages of successful seed germination). (comment from Dan Winter - We might suggest a more direct way of summarizing what the Abstract suggests-namely - that NON-DESTRUCTIVE CHARGE COMPRESSION (optimized by the self-similarity which Golden Mean Ratio perfects) CREATES INFORMATION DENSITY /self awareness, self-organization - not just in the brain synapse -and in the harmonic cascade of brainwave ALPHA-THETA-DELTA in phi proportion (identifies BLISS /peak experience / enlightenment - PERFECT attention ) - but in ANY vibrating system. span by mental speed (bits processed per unit time) and using the entropy formula for bosons, we obtain the same result. If we understand span as the quantum number n of a harmonic oscillator, we obtain this result from the EEG. The metric of brain waves can always be understood as a superposition of n harmonics times 2U, where half of the fundamental is the golden mean U (1/1.618) as the point of resonance. Such wave packets scaled in powers of the golden mean have to be understood as numbers with directions, where bifurcations occur at the edge of chaos, i.e. 2U 1/4 3 · /3. The variance of the Bose­Einstein distribution equals m2 · m, where m reflects the granularity of the energy due to Einsteins photons (cited from ). If we set the variance 1 and m 1/4 x, we get x2 · x 1/4 1. The solution of this equation is / (1/· ·· 5 p 1·=2 1/4 0:618033), the golden mean. 1 Its inverse 1=/ 1/4 U (also called the golden ratio, the golden number, the golden section or the divine proportion) has the property 1 · U 1/4 U2. Therefore the double geometric Useries: . . . ; 1=U2; 1=U; 1;U;U2;U3; . . .
1 Some authors call its inverse U (1/· ·· 5 p · 1·=2 1/4 1:618033) the golden mean. We hope this will cause no confusion. and is thus a Fibonacci series. It is the only geometric series that is also a Fibonacci series. Essential is the fact that the fractional parts 0.618033. . . of /, 1=/, and 1=/ 1 U2 are identical. more: Phi-Ring the Heart.Does Compression =Compassion =Recursion =Gravity's Heart of the Matter? Phi-Lo-Tactics:(Phi)Recursion/Self Re-Entry-Heart of Self Organization? In-PHI-Knit Charge Compression: The Heart of the Gravity Well? Turning Inside Out: Wave Guide to Heart learning to Feel? Golden Mean Ratio in the wave lengths of HYDROGEN. With one of Randy's favorite quotes saying, "Just say Balmer M3 and the body knows what its for". by way of footnote- stay tuned as next time we ask..
Dear Laurence Gardner ('Realm of the Ring Lord') - Why do you suppose - all of the SUCCESSFUL blood lines at the very ROOT ORIGIN of sacred ancestry.. were called: "The SHINING Ones"
Do YOU think it looks like a grail cup? 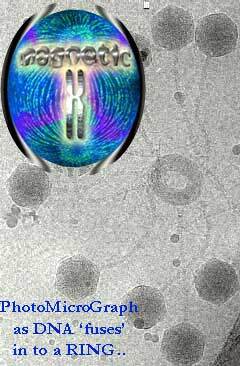 We congratulate Laurence Gardner on his scholarship to locate the unity between the Grail and Ring Lord traditions of the Annunaki Draco Queen blood lines.. All that is needed now is to understand the charge hygiene required to teach that as a science of bliss - to assemble the charge density necessary to ignite the DNA to that SHINING ONE - charge radiance.